I once appeared in a loony reactionary rag. Those were good times. That you with the "Capitalism not worth saving" board? He needs to lose the unibrow. LOL at the caption too: "But this isn't about Marxism or opposing the free market"
You remind of this holy hieromartyr. Priest Dimitry Ovechkin. Photo from the investigative records, 1930. Holy hieromartyr Dimitry Ovechkin was a typical village priest who served in the Church of St. Procopius in the village of Kuznechikha, Osinskoe region. He was born in 1877 to a peasant family. Probably he had to make no small effort to receive his education in the Kazan seminary. He was ordained a priest at age 32. Bishop Palladius ordained him in 1909. Father Dimitry began his “way of the cross” in 1922, when he refused to participate in the commission for the confiscation of Church valuables. He was then given a commuted sentence of six months imprisonment, but in 1930 he was given a real term of three years in concentration camp, accused of “organizing a protest against events conducted by the Soviet government”. In the year of the “Great Terror” he again came to the attention of the NKVD. 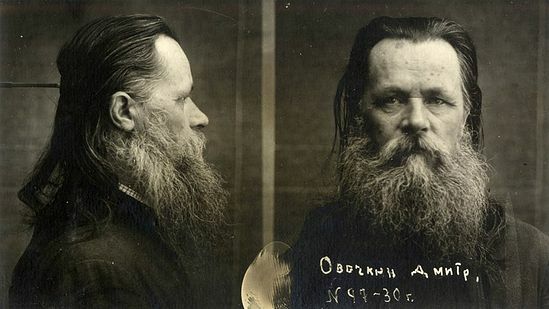 People were found who agreed to testify against him: he supposedly talked about the crop failure and famine enveloping Russia, about the extremely difficult conditions of life when he, a priest, could not get a job (Father Dimitry had a wife and three children to support), and about how the party administration was turning people’s attention away from the economic problems by staging the spectacles of trials according to plan. What of this was true and what was contrived? The main thing is that witnesses were found to testify. This is my favorite cigar. At least on my dime. If someone else is paying, I'll have the La Aurora. I am pretending not to smoke. And I tire of my pipes. For some reasons I've been craving cigars with coffee (I've had maybe a total of 3 dozen of the former in my entire life and I am not a big coffe drinker). How much is the above going to set me back? And what other inexpensive suggestions do you have? The guy at the shop will talk my ear off about this as well, I like to cast wide nets. You have a nice looking mother James. Punch cigars are not terribly expensive for being hand rolled. It all depends on the tobacco tax in your area. The base price for the average punch is around $4.00. The Gran Cru and Grand Puro Punches are a little higher. I don't know of any Punch that retails for more than $8.00 before tax - at least not that I can remember buying. The machine rolled Punch London Club and Elite cigars go for around $2.00 before taxes. Same basic taste as the hand rolled, but short filler. They are made from the scraps of the hand rolled cigars. Hand rolling leaves a lot of "waste" that really is pretty good tobacco. In fact, the first cigarettes were made from scap tobacco from cigars. There would probably fewer health problems if they still were. It definitely puts his posts regarding his mother in a different perspective. From another thread, me relaxing with a Montechristo Afrique cigar. Cup of cofee is out of the bounds of the photo. That's a great pic! Nice. Cool! Can you explain the footwear (or lack thereof) in the pictures? Why, Exodus 3.5, of course! It's my understanding that Copts (and Ethiopians/Eritreans IIRC, maybe others too) often don't wear shoes into churches out of reverence. I wish I could take my shoes off during church, that would be awesome. 2. the fact that I am a bit sheep-like and I'm too scared to be a trendsetter. Well, as a consecrated member, I follow along with other chanters, readers, subdeacons, and clergy on keeping strictly in taking off our shoes when approaching the area just outside the altar (other churches are stricter, askin you to take off your shoes outside the church). This is a wedding. I think at this point the cleric is a bit lenient for the bride and groom not taking off their shoes and not wanting to mess up the women's hairs on this special ocassion. I'm sort of amazed at the amount of weight (fat?) mina has lost. What was your diet/excercise regimen? It seemed like you lost a lot of weight in a short period of time, is that true? Were you still able to fast? Anyway, congrats on your success. In a limited sense, yes. Yeah, from 1,400 calories. Ouch. What sort of foods were you eating? I would limit meats to mostly chicken and fish, because they have the least fat. Beef has te highest fat content (which is why I loved I so much I guess). Little to no carbs, but if carbs, little fruits and whole wheat is fine. On extremely busy days, I have beef jerky and protein shakes. On fasting days, I stick with fish and boca burgers, and beans beans beans. It requires a lot of calorie counting but also protein counting as well. A lot of people make the mistake that they only count calories but take very little protein, and they don't get valuable nutrients and end up losing muscle mass. Working out of course is also important as well as vitamin supplements. All of this was done under the guidance of my nutritionist. Well glad to see it worked out very well for you. Good job. I love my fruits though. I've been trying to limit my carb intake recently but I have cravings like you wouldn't believe. Well, you look very nice, but I'm not so sure about the guy holding you. Actually the winter fuzz hides the worst of the ugliness. Oh yeah. My friend is a 6 week old Cane Corso pup named Napoleon. You are a med student? If so, I think you might know of the dangers of truly high protein diet. Get plenty o'fat if you are going restrict carbs. In any case, great job. One helluvan accomplishment! With my two boys at the NOLA zoo. The girl was too scared of the dinosaur to be in the photo. What was the temp that day? Cause I really want to commend you on covering your body under "extreme" conditions. Not even a sandal. Hope stirs. It was fairly mild, probably mid- to upper-80s. In America that is tortuously hot! People peel down to shorts, sandals, and tanks. Thank you for not doing so and looking quite fine while you were not at it. Hi, everyone. I'm new around here, so if your first thought when looking at these two pictures is "Who's this kid?" That's perfectly alright. Here's me with my mentor who teaches me how to chant during the summer and Christmas vacation months. And here I am again not in my raso and trying to look normal. I don't know even know why I'm posting this picture; my hair is such a mess. NightOwl: very nice picture too! And congratulations I find this American (well, I know it's not practiced only in USA) really great. For sure it's an unforgetabble moment. KostaC: I think the first pictures was taken in the church of which photos I put yesterday in the thread "werid iconostaes" So that's mean you are a byzantine chanter? I actually prefer it to the neo-Baroque architecture that one sees a lot in Istanbul, truth be told. Not quite. I have a long way to go. I've been at it for almost three years now, but all I do is hold isson and chant whatever hymns I've memorised, like Agnie Parthene and Psalm 136. This summer, however, is the summer when I plan to learn how to read Byzantine notation. I plan on becoming literate in Byzantine notation or die trying.